Christopher Buxton was one of the Douai Martyrs, 160 Catholic priests & lay people, trained in the English College at Douai, who were executed by the English state between 1577 and 1680. Having completed their training at Douai, many returned to England with the intent to minister to the Catholic population of England. Many were arrested under charges of treason and conspiracy, resulting in torture and execution. 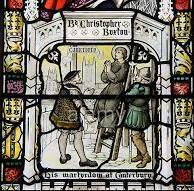 Christopher Buxton was hanged, drawn and quartered on 1 October 1588 in Canterbury, where many others perished.